Intelligent AR (12.2017) - Chamartín + JUVENIA + Feria nacional Sello + EXFILNA 2017. Code PDES17 CH17. 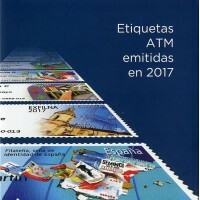 Pictorial folder with eight sets of four values, all the designs issued in 2017 (8 x Tarifa A - A2 - B - C).